A nice hug from the mare. She really is a good girl. 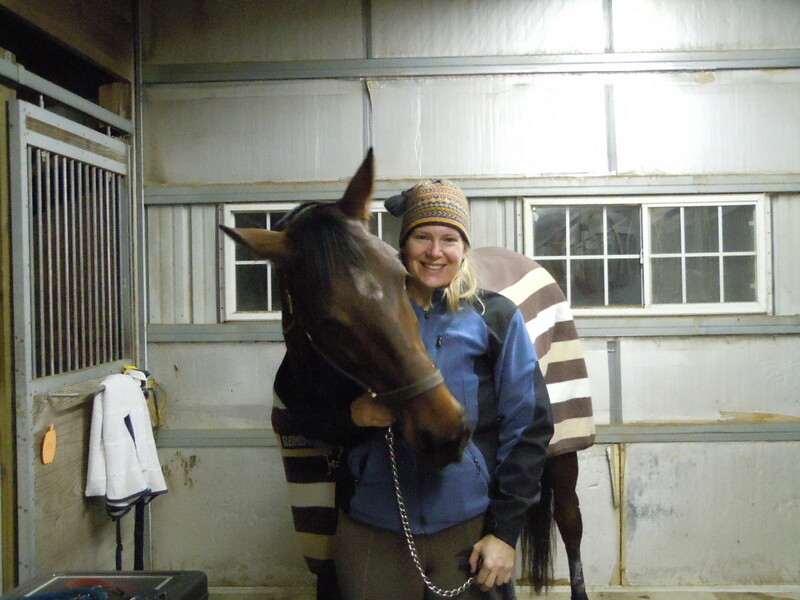 Last night’s ride was fun but not terribly satisfying, though, as you can see, I got a nice hug out of the deal. Christy was schooling her baby OTTB Remy, and Stef was working Oliver. It was nice to have good company! But I was bedeviled by the problem I mentioned a couple days ago – getting Maddie off my inside rein. We circled, we serpentined, we did figure eights. And for the most part, the contact was crap and it showed in the ride. I gave on the inside rein, releasing it when she hung, and that helped, but it didn’t fix the problem. The real problem, I knew, was that she wasn’t fully bending into my outside rein. We continued on, and toward the end of the ride, Mads started to exhibit what I call “pony brain,” which is a euphemism for an onset of fussiness toward the end of the ride. I closed my legs, tapped her with the whip a couple times, and sent her forward. She didn’t work that hard. Pony brain isn’t acceptable. She bought herself some more work. 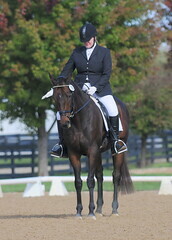 When pony brain or other distractions set in, that’s when I really sit up and ride. I have to be more assertive with Mads in order to keep her focused and forward. Sometimes, it’s a little scary for me to take charge when she starts to develop an attitude. But I know from experience that the correct – and safer – thing to do is to hike up my big girl pants and ride. The worst thing I could do would be to get off. That would be unequivocally rewarding bad behavior. So, I sat up and rode. And in those last minutes, we had some decent moments. In fact, a video of those last moments shows some decent work, including a few respectable steps of leg yield at the trot. I thought about this a lot, then went back and watched the video. It’s not pretty but I found the problem. I wasn’t riding Maddie forward. For most of the ride, she was doing the laziest school horse jog. No wonder I couldn’t develop good contact – I wasn’t generating any energy for the most part and she wasn’t “through” and working over her back. As a result, she was going through my outside rein, leaning on the inside rein, and all sorts of other nonsense. I need to drive her forward into the contact. I need to get a decent working trot! I’m off to the barn to ride — really ride — the mare. “Combing the reins” rocked my world yesterday. My instructor showed us how it can help improve meaningful contact, while also encouraging the horse to stretch into the bit. Have you tried it with your mare? No, but do a post on it, i’m all ears!